The people said, "Now we know you are possessed by a demon. Even Abraham and the prophets died, but you say, 'Anyone who obeys my teaching will never die!' 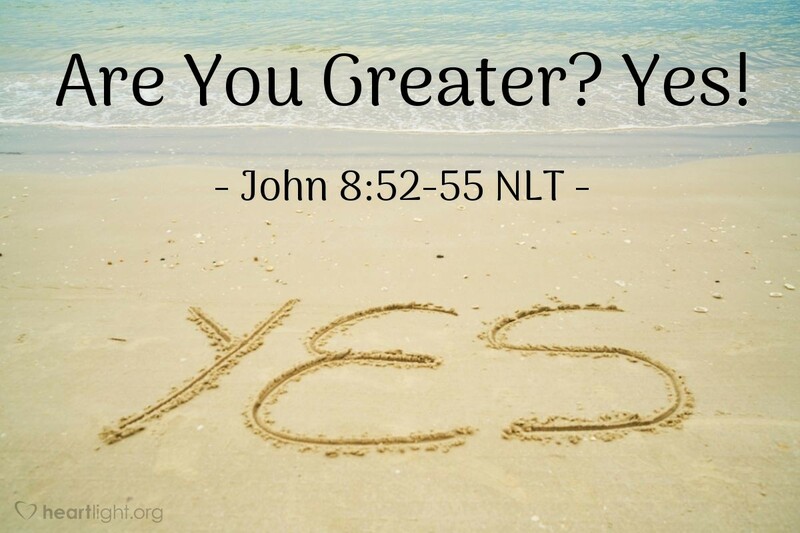 Are you greater than our father Abraham? He died, and so did the prophets. Who do you think you are?" Jesus answered, "If I want glory for myself, it doesn't count. But it is my Father who will glorify me. You say, 'He is our God,' but you don't even know him. I know him. If I said otherwise, I would be as great a liar as you! But I do know him and obey him." Sometimes the doubts of the crowd become our reminder of the truth. "Are you greater than our Father Abraham?" the people ask Jesus. That's the question we are to ask. The answer? Yes! He is, and he is to be obeyed just as he obeyed the Father. He knows the Father and reveals him to us. Yes! Jesus is greater because he is God's Son and our Lord and Savior, the Christ. All praise to you, God most high, and all praise to Jesus, your Son and my Savior. You planned my deliverance, dear Father, and purchased my salvation through the gift of your Son who brought life and immortality to light in himself and in his message. I pledge to you, O God, my heart and my life. In Jesus' name. Amen.